Afi-Tiombe’s presentations have been heralded as powerful, stimulating, informative, and entertaining. Afi defines herself as an actor and oral historian of African-American history. Her one-person readings and plays represent a program of great impact. It is her intention that the audience should be educated, enlightened and entertained by her tales. 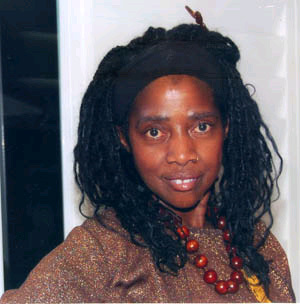 Afi-Tiombe has studied African-American history for over twenty-five years and uses the this mastery to convey her one-woman programs. Afi is also an amputee as a result of childhood cancer. Her presentations often combine both her culturally rich background and her disability. She quotes, “My goal is to display what can be lost by treating disabled people as non-persons, and what may be gained by integrating the disabled within our communities as equals.” Ms. Kambon develops her writings to help culturally diverse communities, and those with a disability to build self-esteem. Afi-Tiombe’s extensive research and articulate presentation combine to hold audiences spellbound. The word most used to describe her program is “powerful”. Her program is divided into two segments-a seventeen-minute play entitled “Black Diamond” and a twenty-four minute presentation entitled “An Extra Cup of Molasses”. “Black Diamond” is the story of a young slave mother who gives birth to a child with a disability. It becomes a passionate story of emotions when the young mother faces the reality that she will lose her son as there is no place in the community for a child with a disability. “An Extra Cup of Molasses” delves deep into the roots of slave history dating back to the eleventh century. Burdened by the need to perform sexual favors, a young woman is rewarded with an extra cup of molasses. Although the era of time may be in the past, the reality of contemporary women’s minority and sexual abuse problems has not changed. Ms. Kambon has also developed a wonderful reading for young children called “The Wishing Flower” and it represents an upbeat look at how two children from different cultural backgrounds can become friends and share dream stories. She has a Bachelor of Arts Degree from Hayward University and is currently pursuing a Masters Degree in Theatre Arts and History.